We (Jan and Jon Brieger) have been full-time potters since 1980, when we built our first kiln in San Marcos, Texas. After 12 years of selling our work at shows and wholesale, we opened our current retail location, Brieger Pottery, in the beautiful Texas Hill Country town of Blanco in 1992. 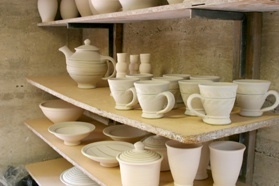 Our focus is to make high-quality, functional stoneware pottery using native Texas clay. The clay we use is from the same source that early Texas potters used to produce the utilitarian pottery and storage containers common in the late 1800’s and early 1900’s. We continue this tradition and give it a contemporary flair. We make a variety of items for everyday use in the home, serving pieces for special occasions, along with a selection of “one of a kind” items. Our pottery is thrown on a potters wheel (Jon) or slab built (Jan). We mix our own glazes and soda-fire all our work in an 80 cu. ft. propane fueled kiln. 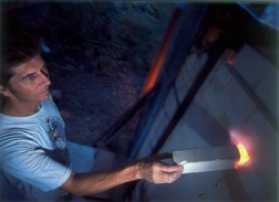 Soda-firing involves spraying a mixture of soda ash and water into the kiln at 23000 F. This mixture is carried throughout the kiln and “flashes” onto the surfaces of the pots giving the clay surfaces a toasty sheen. The soda also causes some of the glazes, particularly the Shino, to take on an iridescent appearance. 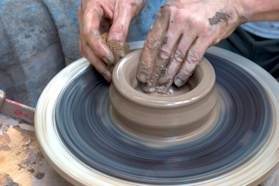 We use three main glazes on our pottery: Shino, Celadon and Cobalt blue. 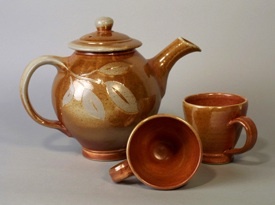 These are western versions of traditional oriental glazes. We love Shino’s rich warm variations of color with beautiful flashing from copper to earthly orange, Celadon’s deep, sea green, translucent quality and Cobalt blue’s rich color that has always been popular with our customers. Jon uses a technique called wax-resist to decorate much of our pottery. This is where wax is applied to the pot with a brush to create patterns such as leafs, strips, feathers, etc. The piece is then dipped into the glaze and the waxed area prevents the glaze from adhering. The wax then burns away during the firing and leaves the clay exposed, creating a nice contrast with the gloss glaze. Jan creates slab built platters and bowls on which she impresses freshly picked grape leaves (from the native grape vines on our property) into the soft clay. Removing the leaf, its detailed impression is captured in the clay. These pieces are left unglazed, wiped down with iron oxide, and fired in a special location in the kiln where they will receive a coating of soda ash. This creates a lovely sheen, which highlights the leaf’s impression. She also loves texture and uses many found objects as drape molds for her pieces and to texture her pots. We believe that food and drink served on beautiful, handmade pottery just seems to taste better, making for a unique and enjoyable experience. The concept of pairing food and the pottery it’s served on (almost as you would pair food and wine) is a movement that is catching on with chefs and potters. 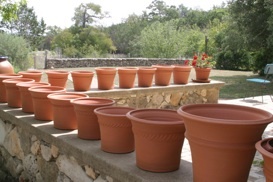 We embrace this idea and hope that our pottery combined with hill country cuisine will be a great combination.